The 2012 Petra Cyber-Archaeology Cultural Conservation Expedition: Temple of the Winged Lions and environs, Jordan - Notizie di Archeologia. Figure 1. 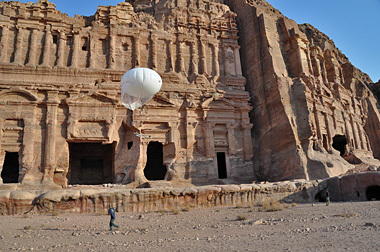 UC San Diego balloon photography in action in front of the Royal Tombs at Petra, Jordan (image taken November 7 2012; courtesy of T.E. Levy, UCSD Levantine Archaeology Laboratory). Cyber-archaeology is the marriage of the latest developments in computer science and engineering with archaeology. Digital advances are enabling archaeologists, traditionally experimenters and early adopters of new technologies, to use ever more powerful and portable devices to collect and analyse vast amounts of information from the cultural and natural environment. Simultaneously, rapid economic development, regional conflict and population growth have increased the threat of damage and destruction to global archaeological resources. 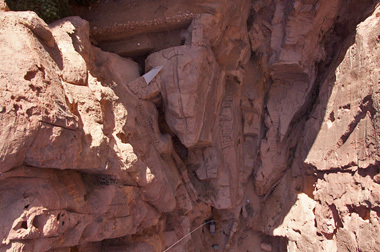 The recent partnership between the University of California, San Diego-California Institute of Telecommunications and Information Technology (UCSD-Calit2), the American Center of Oriental Research (ACOR) and the Department of Antiquities of Jordan in the Petra Archaeological Park represents a case study in how cyber-archaeology can contribute to both conservation and research goals of different stake-holders. The UCSD-Calit2 has been engaged in cyber-archaeology research in the Faynan district of Jordan, c. 25km north-west of Petra, since 1999 (Levy et al. 2012). As Petra and Faynan are both part of the region known as ‘Edom’ in biblical and other ancient sources, the history and environment of these two areas are interwoven (Taylor 2005; Comer 2012). 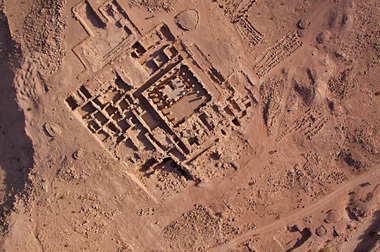 Here we outline field applications of cyber-archaeology implemented over a two-day field campaign conducted close to the Temple of the Winged Lions, a structure thought to have been completed c. AD 27 and dedicated to the Nabataean goddess al-Lat/al-‘Uzza, the consort of the god Dushara (Hammond 1996). 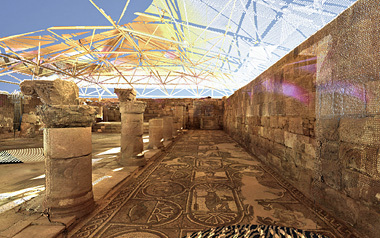 The applications include balloon-based high-definition photography, LiDAR (Light Detection and Ranging laser) scanning, Structure for Motion (SfM) photography to generate point cloud data to complement LiDAR, and AR (Augmented Reality) applications for enhanced virtual tourism in the Petra Park (Figure 1). In 1985, Petra was named a UNESCO World Heritage Site (WHS) because of its unique role in the history of ancient Arabian trade and its spectacular cluster of monuments including elaborate tombs, intricate hydraulic systems and many other features of the Nabataean era, as well the Roman, Byzantine, Medieval and Islamic periods. The complex extends 264km² across a rugged landscape of sandstone mountains, plateaux, wadis and plains (Taylor 2005; Comer 2012). After achieving WHS status, and especially since its recognition as one of the ‘Seven Ancient Wonders of the World’, Petra has attracted large numbers of visitors, challenging the capacity of the archaeological park. Figure 2. 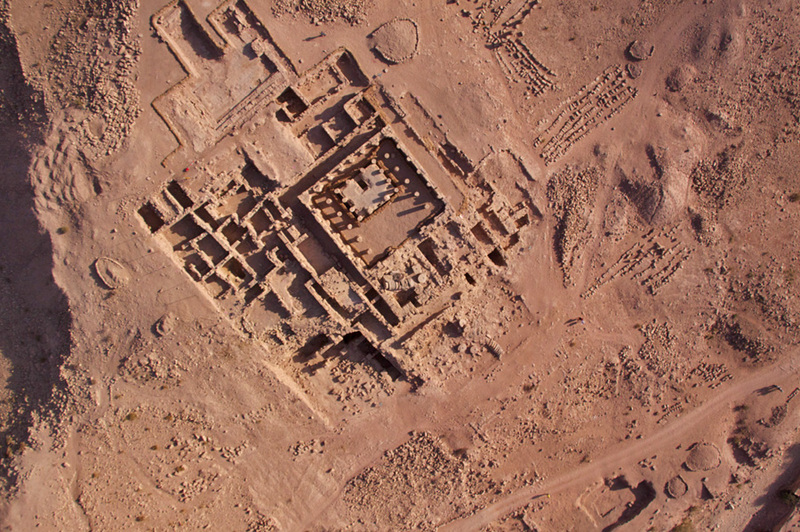 Balloon photo of Temple of the Winged Lions taken from c. 120m. Aerial images will be used to monitor site conservation concerns. Figure 3. 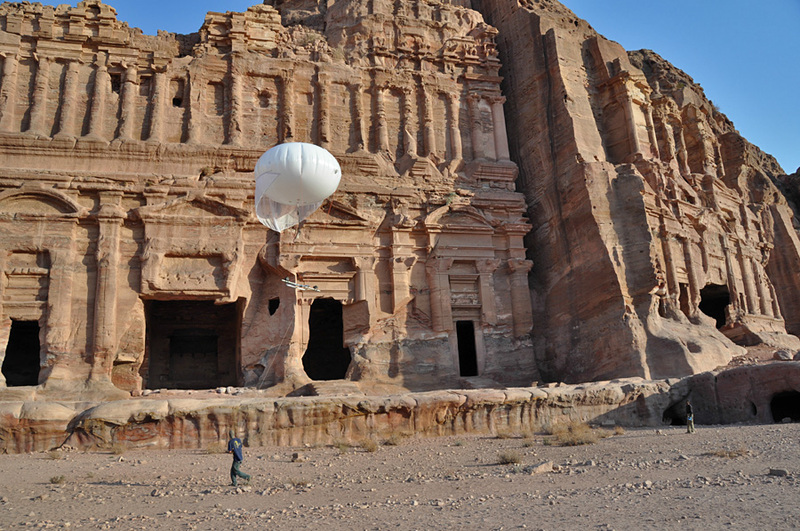 Balloon-based photography is also used for documentation of archaeological excavations. Here, a series of dams in the Wadi Jarra to the south of the famous Treasury monument are currently being excavated and photographed from a vertical angle that will facilitate the construction of point cloud and 3D models. Balloon height c. 70 m.
The Temple of the Winged Lions and its environs were subject to detailed coverage by balloon photography (Figure 2). Varied wind conditions and terrain led the team to apply different strategies across the area, for example low-altitude (10–25m) or high-altitude (75m or higher) photography. The 3572 photographs collected were entered into a photogrammetric 3D modelling program (AgiSoft PhotoScan). This program detects matching points in overlapping images and uses photogrammetry and metadata (aperture, shutter speed, ISO, lens type, etc.) to calculate the location of the camera relative to the scene. From the resulting point cloud, the geometry (in this case, relative elevation) is calculated (Figures 3 and 4). Finally, photographs are draped onto the resulting 3D models and orthorectified imagery is exported. Figure 4. Point cloud model of the Wadi Jarra with one of the dams currently being excavated. The point cloud will be used to create the geometry of the wadi scene, which allows for the creation of a digital elevation model (DEM). Figure 5. Screen shot of the LiDAR point cloud depicting the mosaic floor on the south side of the Petra Church. Data processed with UCSD Calit2/CISA3 in-house point cloud visualisation software Visicore, developed by Vid Petrovic. A terrestrial laser scanner (LiDAR) was used to collect three point clouds of the interior of the Byzantine Church (Fiema et al. 2001) representing approximately 10 000 000 points, and five point clouds of the Temple of the Winged Lions totalling approximately 28 000 000 points. The surveys were conducted in a single day using a Leica ScanStation 2 in conjunction with the rapid scanning or ‘Rescue LiDAR’ methodologies developed by UCSD’s ELRAP. In the Byzantine Church the survey captured the interior architecture including high-resolution detail on the north and south aisle mosaics. Both the interior and exterior architecture of the Temple of the Winged Lions were scanned, as well as surrounding areas, incidentally acquiring a point cloud of the façade of the Great Temple across the way. Simultaneously, a photogrammetric survey was undertaken to collect over 8000 photographs for the creation of point clouds using SfM techniques. This entailed the documentation of every feature from a variety of angles at a comparable photo exposure. These sparser point clouds are used to enhance the high resolution point clouds collected from LiDAR by filling in laser shadows left by the mechanism. Additionally, the high quality imagery collected as part of the SfM survey can be utilised to enrich the photo-realism of the LiDAR dataset. LiDAR captures geospatial information which can be layered with imagery to create an accurate model of millimetric precision. Such high-resolution laser scanning of endangered cultural heritage sites provides a detailed record of structures which may be under threat from erosion, vandalism or construction. Annual scans can track changes and inform conservation practices to prevent further damage. In the case of the Byzantine Church, our scanning preserves a detailed record of the recently restored mosaics. Any future scanning will be able to detect movement which requires conservation action. Figure 6. ARtifact on an Android tablet recognising two figures within the point cloud of the south mosaic aisle in the Petra Church. 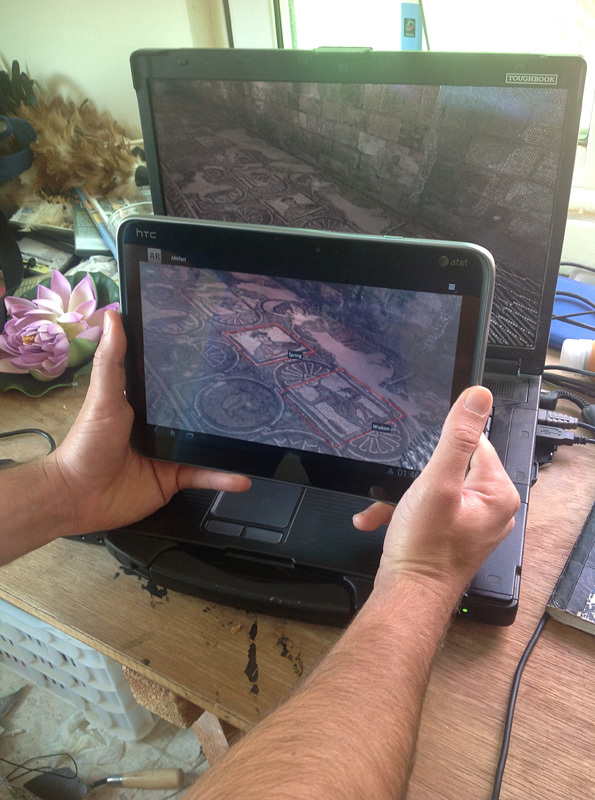 An essential aim of our 2012 fieldwork was to collect photogrammetric and point cloud data to be utilised in ARtifact, an in-house AR application created for UCSD’s Calit2 and CISA3 which allows users to retrieve reference information regarding sites and artefacts on tablet devices. In practice, this allows visitors to point their tablet camera at artefacts or features which are automatically identified and relevant information extracted for on-screen display. Different levels of annotation provide in-depth or cursory detail for the travelling scholar or curious layperson alike. Visitor access to annotated data collected for scientific documentation purposes also enables a new level of accessibility to otherwise archived information that only a few specialists will otherwise ever see. As part of the processing of the LiDAR and SfM point clouds and photogrammetry from the Byzantine Church and the Temple of the Winged Lions, ARtifact has begun to address the public archaeology issue of what kind of data can and should be annotated over the real-world space to enhance visitors’ experiences. 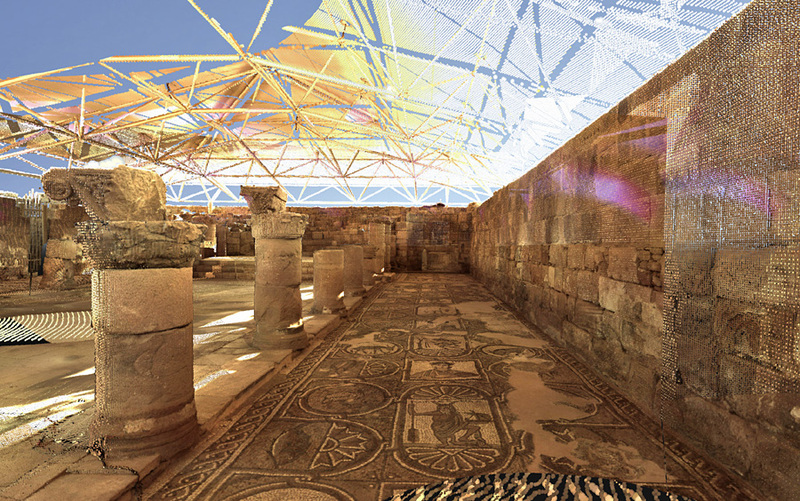 For instance, in the case of the Byzantine Church, not only can the point clouds eventually be included as part of the visitors’ digital viewing experience, but also details within individual mosaics can be accessed providing a level of information far greater than is currently available (Figure 5). Additionally, images of comparative mosaics or re-creations of lost mosaics might be layered into the digital model and allow for an increased level of educative phenomenology. A basic example of this annotation is given in Figure 6. Digital archaeology methodologies provide a unique set of twenty-first-century tools to facilitate both research and conservation. The application of balloon-based high definition 35mm DSLR photography, LiDAR scanning, SfM photography and AR to provide real-time metadata concerning cultural heritage monuments such as the spectacular Byzantine-period mosaics at Petra provides a unique case study in what is possible over a two-day period when the work-flow of these technologies is integrated. Special thanks to Faris Hamod, Acting Director General, Department of Antiquities of Jordan; Asma Shhaltouq, Department of Antiquities of Jordan, Co-Director, Temple of the Winged Lions Cultural Resources Management Initiative (TWLCRM); Maria Elena Ronza, site manager, TWLCRM; Tahani Al-Salhi, Director, Cultural Resources, Petra Park Project; Dr. Emad Hijazeen, Commissioner, Petra Park Project; Haroun Amarat, Department of Antiquities of Jordan; Ueili Bellwald, Director General, Intermonument Restauro Bellwald, Wadi Musa/Petra, Jordan. The Petra Temple of the Winged Lions Cultural Resource Management Initiative is funded through the US Department of State’s Ambassadors Fund for Cultural Preservation (AFCP). The cyber-archaeology research described here is part of the field research component of the UCSD CISA3/Calit2 National Science Foundation Integrative Graduate Education and Research Traineeship (IGERT) program Grant Training, and Education in Engineering for Cultural Heritage Diagnostics (TEECH) at UCSD CISA3/Calit2. Finally, we are grateful to Dr Barbara Porter, Director, ACOR, for her support of this project.